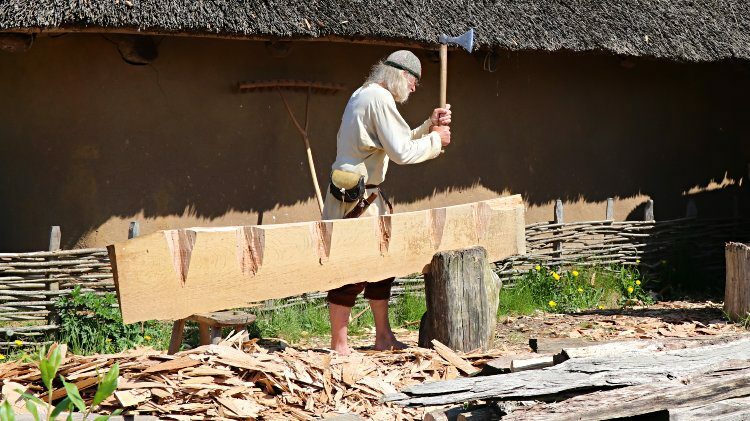 The Hedeby Viking Museum and reconstructed houses at Haithabu in northern Germany is a UNESCO World Heritage listed site one of the top sights to see in Schleswig-Holstein. 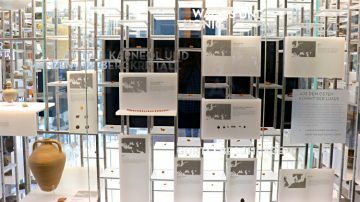 The Wikinger Museum Haithabu (Hedeby Viking Museum) is one of the most important archaeology museums in Germany with an important collection of items dating from the Viking period. It is at the site of one of the largest Viking cities in Northern Europe that played a major role in trade during the Viking era. 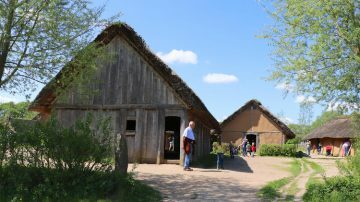 In addition to the formal museum, a few reconstructed Viking houses form an open-air museum village at the original town settlement area still surrounded by a semi-circle ramparts that protected the original city. 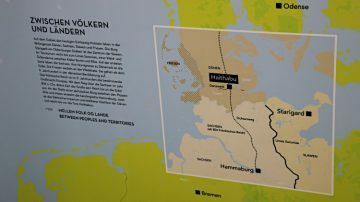 Haithabu, together with the Danneverk, was included on the UNESCO World Cultural Heritage list in mid-2018 – the 43rd listed site in Germany. Haithabu is the modern German version of the Viking city and archeological site. It is located in the district Haddeby, which is the Low German version of the name. The Danish Hedeby is commonly used in English and many other languages for Haithabu. 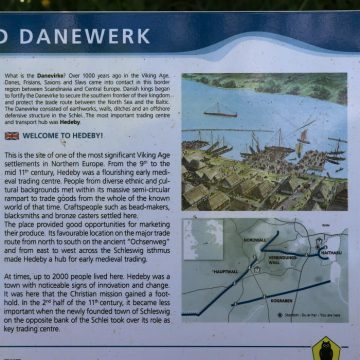 Hedeby, in present-day northern Germany, was a trading post that developed into the second largest Viking city in northern Europe. Hedeby was founded in the 8th century and abandoned after 1066. At its peak, around 2,000 people would live permanently in Hedeby with countless traders moving through. 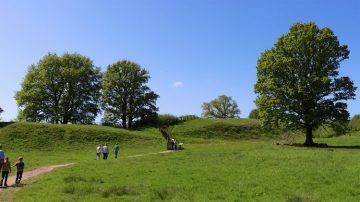 The settlement was surrounded by semi-circular ramparts, which survived and were linked by further defensive ground walls with the Danevirke (Danewerk). Hedeby’s rise was due to its favorable location at the westernmost point of the Schlei fjord – a narrow navigable inlet around 40 km inland from the Baltic Sea. From Hedeby, it was only 15 km overland to Holingstedt on the Treene River that flowed into the Eider and eventually the North Sea. 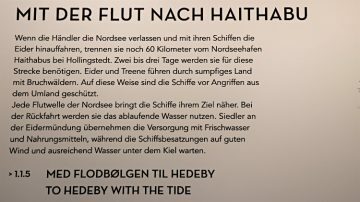 Traders would use the pushing tides generally over two or three days to move boats 60 km inland from the North Sea and then transport goods by wagon the ten miles to Hedeby – a faster and safer journey than sailing around the Jutland Peninsula. Hedeby was destroyed by Norwegian King Harald Hardrada – the last great Viking – in 1050 using burning ships. It was finally destroyed by fire in 1066 after a raid by Slavic warriors and the site completely abandoned. 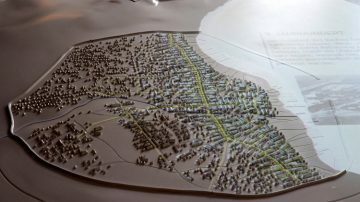 A new city – Schleswig – was founded on the northern side of the Schlei meaning that Hedeby was largely left undisturbed for 800 years and thus is a rich source of archaeological finds. The location of Hedeby surrounded by a semi-circular ramparts was only rediscovered in the late 19th century. Hedeby was for centuries at the southern end of Denmark and at times linked with a defensive wall to the Danewerk (Danevirke). The Danewerk was a series of physical ground walls (with further wooden structures) built over the span of several centuries to protect Denmark from attacks from the south. The first sections were built around AD 700 and in part maintained until the 12th century, although it was used as late as 1864 for military purposes. It was, and still is, the largest defensive fortifications in northern Europe. Schleswig only became part of Prussia after the disastrous Second Schleswig War of 1864 when the Danish crown lost half its territory to German control. As Hedeby was abandoned in the 11th century when the new town moved to the north of the Schlei and never overbuilt, the site is one of Germany’s most-researched and richest sources of archaeological items. 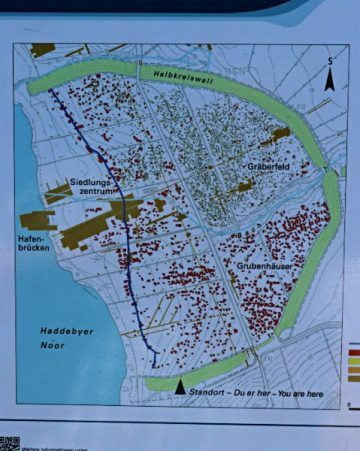 Although archaeological excavations have been ongoing for over a century, only around 5% of the site has been fully investigated. The Wikinger Museum Haithabu thus has all one could expect from a major Viking museum: an explanation of why the city was important, displays of a large selection of Viking era artifacts with explanations of daily life and industry, power play between nations, and models of the settlement, reconstructed boats and Viking graves. A few rune stones are also on display – a popular Viking monument form fairly rare in this region of the world. 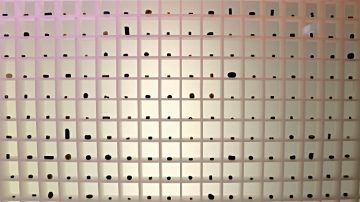 The displays are imaginative and often grouped in themes to explain for example various industries such as the making or glass beads, gold leaf works, cloth and jewelry. The display of Viking weaponry is rather small, as Hedeby was a major trading port but with little direct military presence for most of the time. The museum has the usual selection of coins from all over Europe and the Near East but the more interesting ones are fakes. These were in part made of tin and lead rather than silver or gold. A mold to produce these fake coins was also found, so some of the forgeries were produced locally! 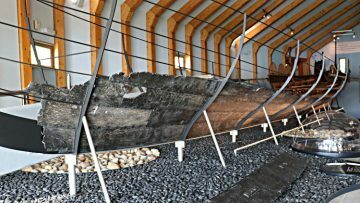 “Wreck 1” discovered at Haithabu was until recently considered the longest war boat from the Viking period. It was 31 m long and built locally around AD 985. It probably belonged to Danish King Harold Bluetooth. It sank around AD1000 at the harbor of Hadeby and many parts were already salvaged for re-use during Viking times. Only a small section survived to the present but a full-size model show what its original dimensions should have been. Another notable find is the keelson of a merchant ship that sank in the harbor of Hedeby. This suggests a 22 m length and a load capacity of 60 tons, which must have placed it amongst the largest trading vessels of the 11th century. The museum points out that Hedeby was a very international city where language from all parts of Europe and the Near East could be heard. Unfortunately the multilingualism did not survive to the present: only the most basic information is translated into English (and Danish). For non-German speakers, an audio guide or comprehensive guidebook is almost essential. It is just over a kilometer walk from the Haithabu Wikinger Museum building to the reconstructed Viking houses (Wikinger Häuser). 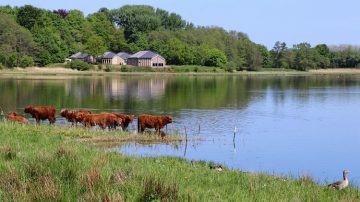 En route, visitors may walk on part of the ramparts and enjoy a bird’s eye view of the semi-circular ramparts and the site of the settlement. Alternatively used the mostly paved paths – driving up to near the village is only permitted for the infirm and bicycles. A group of seven Viking houses were reconstructed on the basis of archaeological finds to give visitors an impression of life in a Viking town. The houses are furnished to give some idea what the dwelling might have looked like for various professions and trades. The houses are that of a comb maker, a cloth maker, trader, wood worker, fisher, as well as an inn and a meeting hall. Various crafts are demonstrated with a variety of activities offered depending on the season – weekends and school holidays are far busier. No descriptions of any kind are available inside the Viking village but a very comprehensive pamphlet is included with the ticket. The Hedeby Viking Houses (Wikinger Häuser Haithabu) are open only during the April to October season – daily from 9:00 to 17:00. The village is closed during the winter season. The circular ramparts and connecting walls to the Danewerk are always open and free. Admission to the Wikinger Museum Haithabu is €7 for adults and €5 for children under 16. A family ticket of €15 allows in two adults with own children (or grandchildren). Admission includes both the museum and village area – separate tickets are not available. An audio guide is good value at €2 and almost essential for non-German speakers, as only the most basic headings are also translated into English (and Danish). It covers the museum, Viking houses and a few sights between the museum and the village. 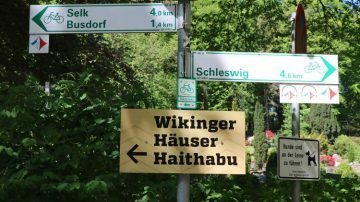 By car, the Viking Museum is easily reached: from the Autobahn A7, use the exit Schleswig / Jagel. The free parking lot is just off the B76 in the direction of Eckernförde if coming from the Autobahn or Schleswig. Schleswig Bahnhof (train station) is quite a distance away from the old town but quite convenient for travel to the museum. It is an easy 3 km walk from the station to the museum, or use bus 4810 (direction Zeigelteich, Kiel) or bus 1635 (direction Stexwig Dorf, Borgwedel) and get off at stop Haddeby / Haithabu, Busdorf – check timetables at Deutsche Bahn, as there are huge gaps in the schedule. (The same buses also run from Schleswig ZOB / Central Bus station, which is near the cathedral and old town). 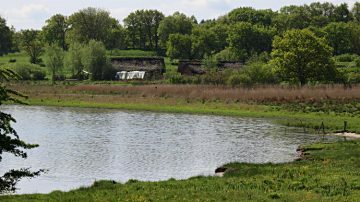 Cycling from Schleswig and to the Danewerk is also very popular with further cycling and hiking routes marked in the immediate region. A pleasant way to cross the Schlei from Stadthafen Schleswig just below the cathedral to the Haddeby stop is by boat. Hein has four departures in each direction from March to September on most days but not on Monday or Friday. Buy tickets on the boat (€4) – bicycles possible if space allows. 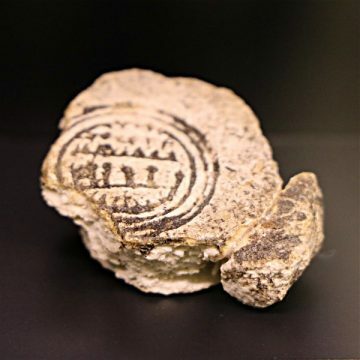 More archaeological finds may be seen in the Museum of Archaeology in the nearby Schloss Gottof in Schleswig. 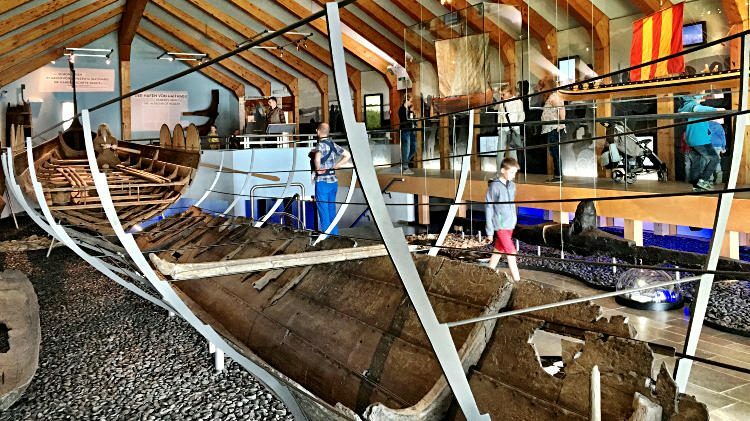 Further north in Denmark, Ribe has a small Viking museum and the Viking Center but the true giant in pre-history and Viking era is the Moesgaard Museum in Aarhus, Denmark’s second largest city.